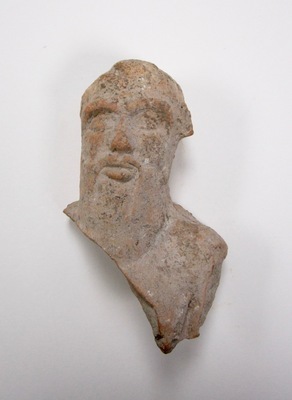 The sculptural fragment dates from the Classical Period of Ancient Greece. It represents Silenus, a bearded creature from Greek mythology who was the drunken companion and tutor of Dionysus, the god of wine. He was noted for his prophetic abilities. Silenus was normally represented as a heavy-set and good-humored old man. Being part man and part animal, he was also often shown with horse ears and sometimes horse legs and tail.